The Greater Scranton Chamber of Commerce has announced Judith G. Price, Esq. as a speaker for this year’s Empower conference. 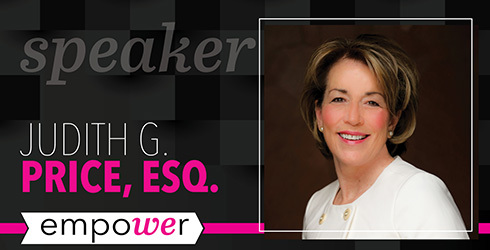 As First Assistant District Attorney of Lackawanna County, Judith G. Price, Esq., brings more than 38 years of legal experience in domestic and criminal law, wills and estates, and personal injury and civil litigation to her role. A founder and principal of Moosic-based Dougherty, Leventhal and Price, LLP, she is a former certified mediator with the United States Federal District Court for the Middle District of Pennsylvania, and has been a solicitor for various county and municipal authorities including the Scranton Municipal Parking Authority, City Controller’s Office, Lackawanna County Board of Assessment Appeals, and Lackawanna County Bureau of Children and Youth Services and Area Agency on Aging. She holds her Bachelor of Science degree from College Misericordia and her Juris Doctor degree from the Temple University School of Law.